Chinese Scientists Claim: Peak Solar Activity Drove 2015/16 El Niño | Watts Up With That? Wen-Juan Huo and Zi-Niu Xiao, two physicists at the Chinese Academy of Science, have published new research today suggesting that the strong 2015/16 El Niño event occurred right after the 2014 solar peak and may be directly linked to strong solar activity. 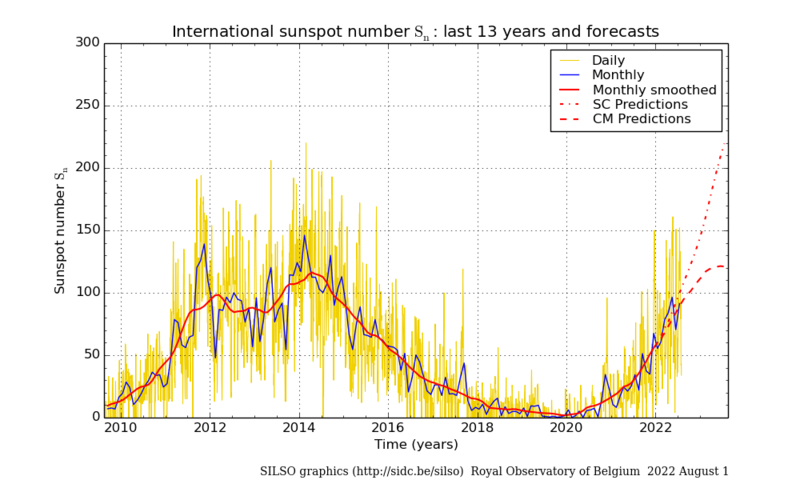 The Chinese scientists found a significant positive correlation between sunspot numbers and the El Niño Modoki index, with a lag of two years. Moreover, strong El Niño events were found within 1–3 years following each solar peak year during the past 126 years, suggesting that anomalously strong solar activity during solar peak periods may be the key trigger of such El Niño events. These findings may help explain the rapid rise and fall of global temperatures over the last 2 years. Figure 1. 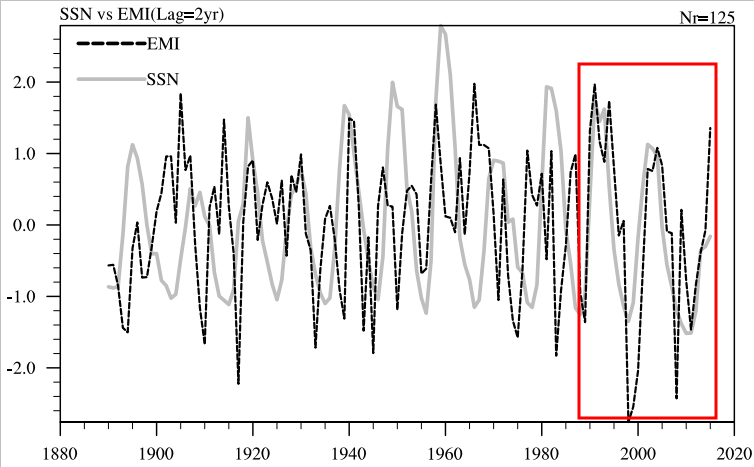 Annual mean Solar-Spot Numbers SSN (solid grey line) and El Niño Modoki Index EMI (dotted black line) from 1890 to 2015, with a lag of two years. This study investigated the modulation of El Niño Modoki events by solar activity, and analyzed the possible impact of solar activity on the 2015/16 El Niño event. The 2015/16 El Niño event is more like a mixture of two types of El Niño; namely, EP El Niño and El Niño Modoki. The EMI has a clear decadal period, similar to the solar cycle, and demonstrates a significant positive correlation with sunspot numbers. Statistical analysis revealed that an El Niño Modoki event will most likely occur in the one to three years following a solar peak year. The solar cycle reached a peak in 2014—the 24th solar cycle since 1755. The evolution of the SST and wind anomalies are similar to the typical features found from historical data composites in peak years and the following one to three years after a solar peak. Therefore, the El Niño Modoki component of the 2015/16 El Niño event might also have resulted from high solar activity. Considering the impact of high solar activity, the El Niño Modoki component in the 2015/16 El Niño event may not decay as quickly as the EP El Niño event. It will likely sustain in the central Pacific, with a low-intensity level, in the second half of 2016. September 10, 2016 in Climate News, ENSO. How Much Of Global Temperature Increase Is Due To El Niño? Kim, I hope I’m not being presumptuous, but this Bob is saying ‘I told you so’, as I said so many times here since 2014 that the sun caused the El Nino. If you were referring to me, thank you. 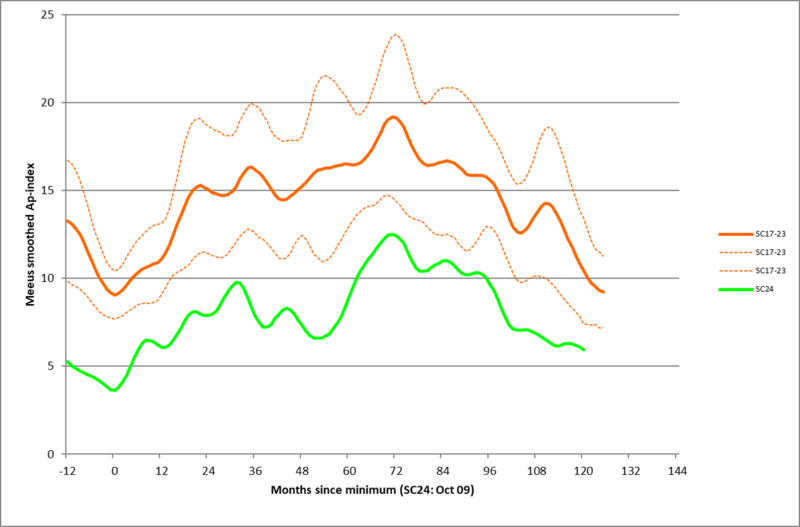 TSI has flattened out for months after a drop in March, and equatorial OHC responded by flattening out. The signs of earth’s solar supersensitivity are abundant. Kim, the idea that the sun’s normal variability drives the weather and climate is slowly taking hold across the world, as evidenced in part by these Chinese scientists who have added their voices to what is certain to become a deafening universal repudiation of AGW. Thanks for the links, BobW. Note also that they are comparing sunspots to the El Nino Modoki Index (EMI), which is an index prepared to identify central Pacific El Nino events (aka El Nino Modoki), not all El Nino events. The 1982/83 and 1997/98 El Nino events are obviously missing (because they were East Pacific El Nino events). The lead post Fig 1 is based on sunspot numbers, whereas TSI is really the operative “heat” variable. Unfortunately the authors didn’t use TSI, as using SSNs unfortunately can lead to misunderstandings. For instance, PMOD annual TSI rankings put 2002 then 2000 on top whereas v2 SSN annual rankings put 1979 then 1980 first. We see a different story when comparing ENSO events to the PMOD TSI composite versus comparing it to the SSN record, post 1978. 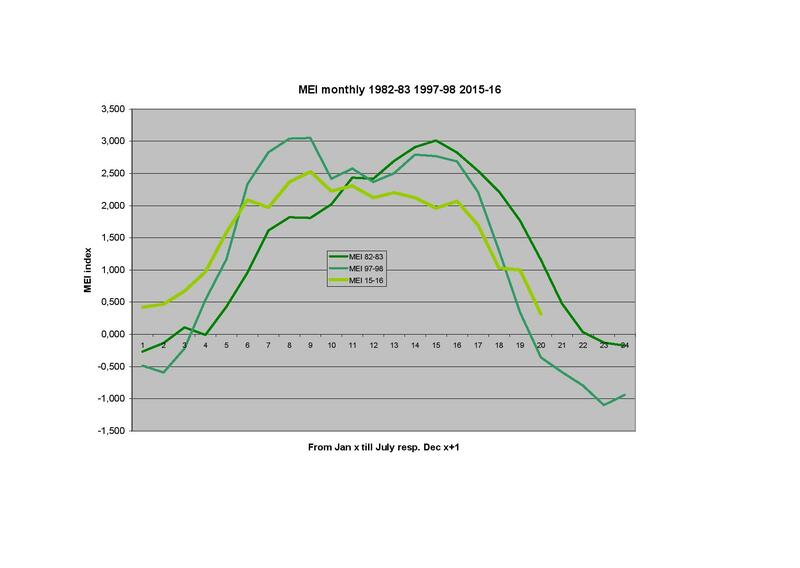 Higher duration TSI during recent solar cycle maximums led to longer duration El Ninos post late 1970s. Something I also see in Fig 1 are El Ninos during the rising SSN (TSI) phase after solar minimums, which can be discerned by examining the PMOD composite data rate of annual TSI change versus SST, or by using monthly F10.7cm or SSN data. Those ENSOs are driven by a fast rate of TSI increase right after the solar minimum, while the post solar max ENSOs are driven by the magnitude and duration of high TSI during the maximum. The lack of great correlation in Fig 1. is because the authors didn’t tell the whole story. PMOD was suffering from uncorrected degradation errors. The latest evaluation shows that there is no downward trend in PMOD. There’s a saying in the spaceweather biz, I’m sure you’re heard it, regarding the source of data being from “whatever is aloft”, … so I use ‘whatever TSI data is available’, PMOD & SORCE. The PMOD annual rankings I gave were calculated from data two sets back, the 1602 version (Feb 2016). I eyed differences in the 1605 data to older TSI values pre-SORCE era as being lowered from the previous version by an offset – but that was a very quick look, and I haven’t looked at the 1608 data at all. I’m wondering out loud right now if earlier this year PMOD adjusted the pre-SORCE years of PMOD data to conform to what you show here from http://www.leif.org/research/No-TSI-Difference-Between-Minima.pdf, on page 2, which would lower the annuals and possibly change the annual rankings. Time to crunch numbers and get back at you on that. If there’s a better post-1978 instrumental TSI record for me to use, let’s see it. As far as your SSN-TSI formula goes, we’ve been through this before, and it wasn’t pretty then, or now. Error is defined as the difference between SORCE annual TSI and Leif’s TSI divided by the range in TSI for the years 2004-2016, ie the (max annual TSI-min annual TSI). -20% to 39% are huge errors!!! But your solar cycle prediction method works well and I very much like the work you’re doing on F10.7cm forecasting using magnetograms. After watching the USAF F10 forecasts every day for two years, I can state that the state of that art needs upgrading. You are not taking into account the uncertainty in TSI. Here is a plot by Claus Froehlich [the compiler of PMOD] comparing all TSI observations. He plots TSI above the minimum values as a function of SSN^0.5. The black curve [the mean] is not not quite straight [hence the SSN^0.7 in my formula]. You can see that the scatter is substantial. The 2-sigma range being 0.5 W/m2. This is what we should compare with, but as you said, we have been there before, and no progress on that matter seems possible considering your bias. As you [hopefully] can see there is a very strong linear relationship [both using version 1 and version 2 of the SSN] so that TSI = a + b SSN^0.7. There error is the inherent error in the actual measurements of TSI. The 2016 SSN is 45.2 as of 8/31, v2 S, not 80.2, for an error of 15% thus far in 2016. Greg Kopp from LASP who handles SORCE TSI, published “Magnitudes and timescales of total solar irradiance variability” this year at http://www.swsc-journal.org/articles/swsc/abs/2016/01/swsc160010/swsc160010.html, where apparently the modern views of TSI on display include the TSI graphic I posted above, with no mention of the composite being invalidated, as you imply. Correct me if I’m wrong on that. When you want to compare the results of your formula to an ensemble TSI of all these various instruments, after we’ve been told how SORCE TIM is the new standard, which is what I used as a comparison basis, then I call that a special brand of cherry-picking used cover the slop in your model! No offense meant of course. YOUR bias is that you never see or admit where you are demonstrably wrong, something I call ‘the other Svalgaard effect‘, which of course others can and are often also so afflicted. if you can’t admit that SORCE invalidates your model in 2015 at a 39% error, your bias has blinded you. I think you have a lot of gall to push your junky SSN-TSI model AGAIN with such errors while at the same time declaring with broad strokes the supposed shortcomings of others’ TSI data composites. I am amazed that you could possibly even consider me biased for simply using the PMOD composite. As I asked you before, and a few other times over the last year, if you have a superior instrumental TSI data set that covers the post-1978 period, lay it on us. The fact is you haven’t delivered. You consistently undermine solar-climate talks with your rather schoolyard bully like behavior where you insist the other guy’s TSI data is bad, but you never point to a daily or monthly TSI data set pre-SOURCE that meets your approval. So it looks to me like you are not an honest player. Thanks to you this conversation has once again devolved back down to your level, your comfort zone. if you have a superior instrumental TSI data set that covers the post-1978 period, lay it on us. 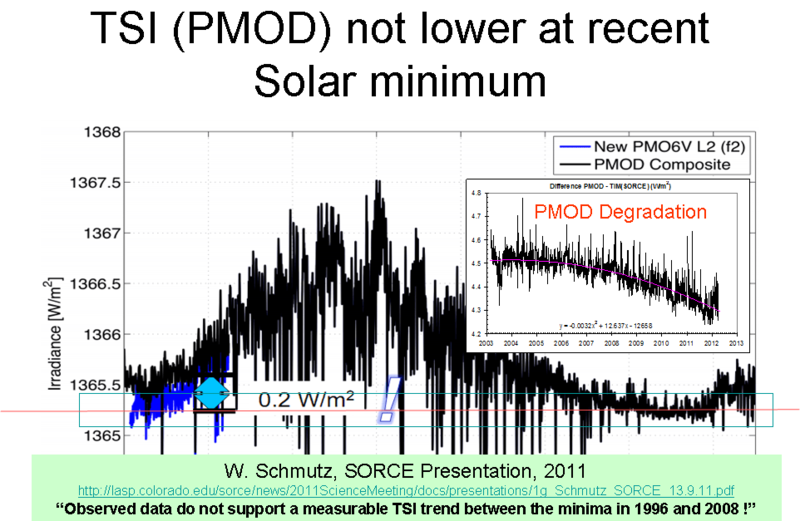 Nobody has a TSI instrumental data set for the post-1978 period that is correct to better than +/-0.2 W/m2. SORCE is still the best but the difference between SORCE and TCTE [the successor to SORCE] is still 0.5 W/m2, so it is silly to hang something on differences smaller than that. This is my analysis of the temperature impact of the solar cycle TSI and the temperature impact of the ENSO (Nino 3.4 index which is by far the best correlation to global and tropical temperature impacts of the ENSO measures) back to the 1860s. I would count this as Zero correlation (although there are the occasional bumps that match up). Standard Scatter-plot of the same basic information. If you remember your stats classes, a big round blob indicates Zero correlation – this one is weighted toward the negative TSI since TSI was lower prior to the 1950s or so). Thanks Bill. Standing back from that graph I see four essentially vertical groupings , ie large varaition in Nino3.4 independent of TSI. I agree, zero correlation. Well, they don’t say on what assumed distribution they call this 95% correlations falls apart if they don’t. Also how many different “El Nino” indices did they test before finding one which showed a very marginally “significant” correlation with a just the right lag? If they tried Nino 3.4 , ENSO, MIE, S.O and Modoki Index before getting a postitive result, they need to recalculate their significance. If they plumped straight for EMI and did not test any others, they need to explain that choice. This stinks like typical bad science: selection bias, and claiming statistical significance where it is not merited. Leif, if we could keep the TSI model uncertainty below +/-.2w/m2 vs +-.5, solar climate hindcasts would be more credible. The past uncertainty is definitely problematic. I would appreciate a model output accurate to .1 W/m2, roughly a 5% error. Several models I made for F10.7 to TSI have been very successful lately, within 0.5%, but it doesn’t hold all the way through the record. We need to have a better TSI model, and I think the method Kopp/Lean have developed is the right way, and is many respects, fundamentally, is based on the same physical solar magnetic properties as your F10.7 & magnetogram work. I checked out PMOD 1608 today, and it was adjusted downward, all of it, from the previous version. The rankings changed, 22 of them out of 39 years, the top three years are the same, and most of the other changes are one or two places. There was no justification given in the data for the changes. and suggests to use the square root of the SSN as the gold standard that TSI should match. As I showed, the TSI-SSN^0.5 relation is not quite linear and SSN^0.7 is the better fit. Such a relationship is also expected on theoretical grounds [Wang, 2003]. Bottom line: any claims to errors, fits, agreements, etc better than 0.2 [or even 0.5] W/m2 are not based on facts. Bill Illis, I have to respect your eight years of continuous improvement and monitoring of your model. 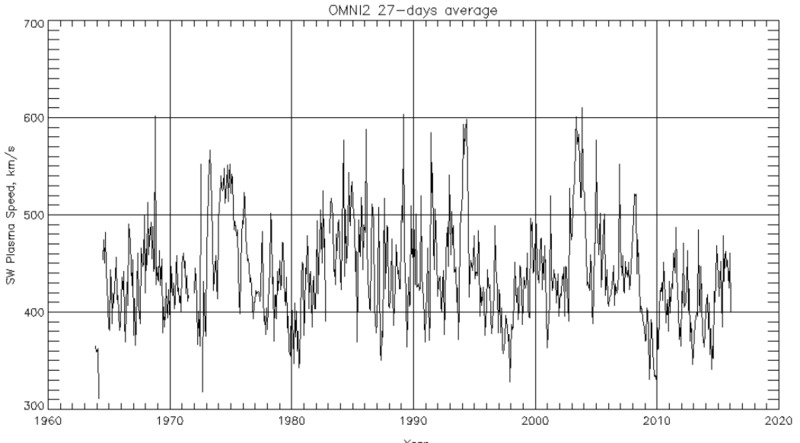 That said, I think your attribution to ENSO is truthfully owed to the sun’s delayed TSI peaks. 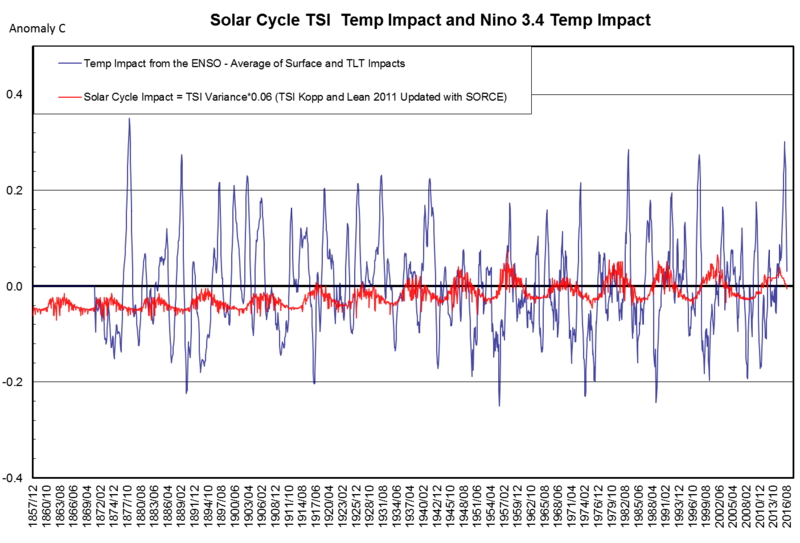 If you would examine more closely both the SORCE and PMOD data and compare to ENSO, you’ll notice a response almost all the time to higher TSI magnitude and duration, with a lag. That is what I think the authors here were talking about. Think about where that solar energy goes, into the top ocean layer, where it takes how long to come out? i’d really like to know whether an El Nino is overall a cooling event for the Earth, or not. That question doesn’t seem to be settled. I think the real question is the magnitude of the cooling, not the existence of the cooling. If you distribute the enthalpy more evenly over the surface of the Pacific rather than piling the warm water on top of itself in the western Pacific, the area of the warm water that can radiate into space is larger. That implies a higher rate of energy transfer into space and less retained enthalpy on earth. The question is one of “Does it make a big enough difference to matter?”. On that one, I have to be agnostic. I am only sure that the GCM do not take it into account. Yes, and it isn’t just distributed over the surface of the Pacific, but apparently over the whole Earth. Much more energy lost to space. Well, the atmosphere covers the whole surface of the Earth, and it radiates more energy during an El Nino than during a La Nina. I would expect that el nino does not, in fact, radiate more energy to space. It is actually a process that converts sensible heat to latent heat. The radiation of that heat happens on the downhill slide toward LA Nina as masses of moisture cooked up out of the Pacific condense and fall as rain or snow. The cooling effect of this condensation/radiation accelerates the process of condensation as we return to a drier state. Disagree if you spread it out by definition it must lower the temperature as the volume is increased. Only way to keep same temperature is to increase the pressure by adding molecules (aka humidity). Lower temp less energy radiates to space. Basic problem is temperature is not equal to energy. The total energy may not increase during el-Nino it may just be repositioned in such a way that our false way of measuring it (temperature) increases. …Silly, El Nino is a male weather anomaly that temporarily thinks it’s transgender self should be female and thus becomes La Ninia….Temporarily…. I say El Niños must be overall cooling events. Under “normal” conditions a large amount of hot water is swept into the western Pacific where it forms the deep western Pacific warm pool. When the trade winds slow, the warm water sloshes back to the central pacific, where it is exposed to the atmosphere. Now the heat can radiate to deep space. The temperature of the atmosphere spikes high as the heat moves through the atmosphere from the ocean to space. But after the heat is radiated away the ocean/atmosphere system has lost a lot of heat. Now the heat can radiate to deep space. Where in the world did you manage to discover any evidence for that? Did you measure it? I guess you never could. “Where in the world did you manage to discover any evidence for that? I don’t understand? Are you saying the greenhouse effect is not real? Hot water that is trapped under hundreds of feet of hot water, cannot radiate heat to space. Hot surface water, and air that has been warmed by it, can radiate heat to space. But Thomas, what makes the water hot before it forms the deep west Pacific warm pool? People get confused when they wrongly concentrate on a static snapshot of a point in a cyclic process, instead of explaining the whole dynamic cycle. Good question. Under “normal” conditions, the trade winds push hot surface water in the equatorial Pacific towards the western Pacific where it accumulates to form the Pacific warm pool. This is the heat retention phase, heat is trapped in the deep warm pool During El Niño events, the trade winds slow and the warm water sloshes back to the central pacific, forming a large surface of warm water, which warms the atmosphere. This is the heat rejection phase, air is warmed and radiates its heat to space. I don’t know if this is correct or not but it makes sense to me. Because you seem to suggest that he science is not – actually – settled. Obviously, it is a warming event – and obviously also a cooling event – whatever the watermelons need at that instant!! Ahhhh – re-education for you sunshine! I trust you are not within the reach and purlieu of the EPA [one example; we in the UK have to make do with a Ministry for Various Things, which, sort-of, Include Climate ( I may not have followed the most recent deck-char reshuffle fully) or similar . . . . ish . . .]. ….Hmmm, who on this site has been saying that for years.. ? And who is the other that has been saying the Sun makes no difference ? ?…Things that make you go…Hmmmmmmm….. If Los Ninos cool, and if these physicists statistics are right we have a nice little negative feedback looking for a mechanism. Why am I looking at clouds? What else could work so fast? Well, I dunno, but I do know I’m dangling way out on a speculative twig. How far down is the ground? Plus many. A source of many GHE misconceptions. It seems fairly clear, to me at least, that during an el nino thermal energy is transferred from the tropical Pacific ocean to the atmosphere, where it can then move upwards into the atmosphere and poleward, and thus ultimately be radiated away into space. The 2014 peak was not very high compared to previous solar cycles.There is something missing here since 2 year lag seems a fast response for the transfer of energy in the system. It doesn’t look like that good a pattern match, with some peaks opposite rather than coinciding. There is some match, but a fair number of misses as well. ….So other factors come in to play ? Thus, a chaotic system…? Sunspot activity is the wrong place to be looking in. If the authors looked at the coronal holes instead they would find a better and more direct cause and effect. Particularly if they looked at other incidental factors such as magnetic field changes occurring at the same time as the impact of the CH solar wind arrival. But yes within a couple or three years after peak sunspot activity there is a significant increase in earth facing coronal holes. Looking at the graph …. there appears to have been a “great leap” in exactness of record keeping and in technology (measuring equipment, etc.) post-1985. This study is cherry picking, possibly from ‘Adjusted Data’. Models, wishful thinking – and less statistics that my cats – any one of them, not all three working together! Why do you paste that redundant info here, just as you did at Roy Spencer’s site? We all are here able to read the pdf. Thanks for mentioning my hero Bjerknes! It is important that el Ninos EP and modoki are becoming recognised as distinct. They are quite different beasts. The EP type is the classic el Nino as named by the Peruvian fishermen as it is driven by the Bjerknes feedback involving Peruvian upwelling and thus perturbs the anchovy fishery. The modoki “el Nino” scarcely deserves to be called el Nino, it does not engage – or only weakly engages – the Bjerknes feedback. The coupled excursions of weakened or even reversed trade winds with interrupted Peruvian upwelling characterise classic EP el Ninos such as the archetypal 1997-1999 event. However the misinformation about a predicted crash disrupted the global fishmeal market – at least one player went bankrupt. Peruvian anchovy is tge largest global source of fishmeal and ordering by China and pricing were disorderly due to conflicting information of fish stocks and falsely pessimistic landings forecasts. Another example of the baleful effect of climate misinformation based pn AGW-driven hype having a destructive influence beyond academic research. This el Nino was modoki thus did not engage the Bjerknes feedback, thus the upwelling was nearly normal and the anchovies did just fine. I think the modoki events should be given a name other than el Nino. Maybe a “el Svalgaard”? Why not talk about geomagnetic activity in this cycle? This is quite normal. Geomagnetic activity always peaks during the declining part of the cycle. Agrees also a very strong El Niño in 2015. One can see why El Niño has not increased earlier, despite forecasts: geomagnetic activity was low and increased in 2014. 1. From the conclusions:” The solar cycle reached a peak in 2014″ which is not the case. Per definitum the maximum of the SSN- cycle is reached when the polar fields have a zero cross. This was in march 2013 ( see http://wso.stanford.edu/Polar.html ). 2. The correlation of ElNino Modoki (EMI) with SSN is faint (R=0,19) and a power spectrum is not shown in the paper but cited. 3. The impact factor of the Journal I could not find http://www.incois.gov.in/library/pdf/downloads/Ocean%20Sciences%20Journals.pdf . I’m not impressed at all. (Ashok, Behera, and Rao 2007; Kug, Jin, and An 2009).” In both “cited” papers ( http://www.jamstec.go.jp/frcgc/research/d1/iod/publications/modoki-ashok.pdf ; http://journals.ametsoc.org/doi/full/10.1175/2008JCLI2624.1 ) there is NO power spectrum or a hint to solar cycles. IMO it’s a fake! Hello frank, I took a look at the two links you listed. No references to anything solar as far as I could tell. Unless it is hidden and I am just not seeing it. I fear someone seriously dropped the ball. frankclimate, from the second paper: Related to these warming periods, we found from wavelet analysis that there is distinctive decadal SST variability with 10–15-yr time scale in the central Pacific (not shown). 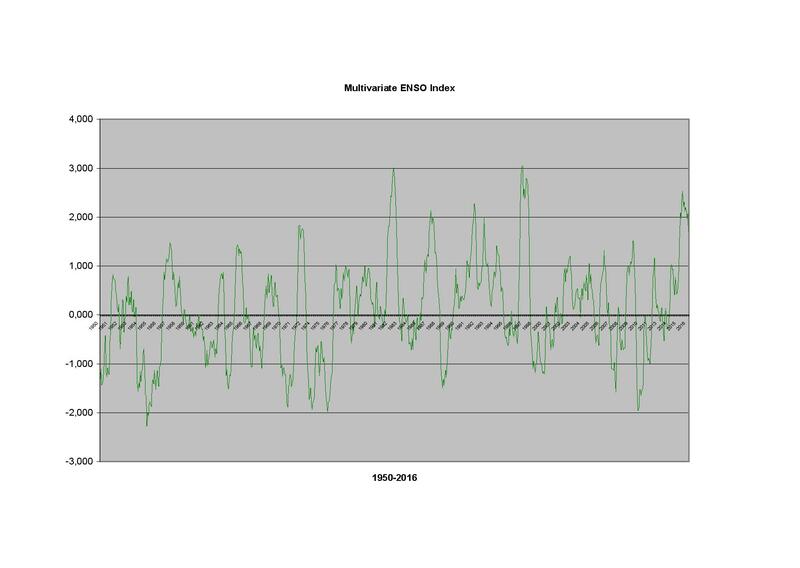 This decadal variability is different from the so-called Pacific decadal oscillation (Latif and Barnett 1994; Graham 1994; Zhang et al. 1997). The first paper calculated empirical orthogonal functions, which look “kind of look periodic”. I’d suggest inadequate citation and likely poor translation rather than fraud. I’d suggest “needs work” rather than “fraud”, though you could be correct. Quoting the correlation coefficient to 6 decimal places and without a confidence interval is at best “amateurish”. I find it difficult to believe that a change in solar activity would push warmer than usual water into a particular part of the pacific ocean 2 years later. I think this should be filed under correlation does not mean causation. Son of Mulder: One possible physical mechanism is changes in cloud, which could slow the trade winds. Slowing trades are a recognized proximate cause of Los Niños. Looks like a perfect candidate for Willis to continue his quest to try to find a single valid correlation between solar activity and climate impacts… I bet he will destroy this paper shortly. I must remember to buy popcorn on my way home. It’ is destroyed! They claim a link of ElNino Modoki to the SC’s and cite studies which support this. But as also Michael analyses: No hint in these studies to the SC or a power spectrum or anything else. The whole paper is a junk! Frankclimate, ” No hint in these studies to the SC or a power spectrum or anything else.” This is not correct see my post at 11:39. Hello Thomas I found the following on the next page of the first linked paper I am not sure what they are trying to say. But I am not seeing it as a “its the sun” declaration from them. If the authors of the ” Peak Solar Activity Drove 2015/16 El Niño” paper are relying on the Modoki paper for support good luck. The dates for the Modoki events shred their position. They wind up short a bunch of solar maxs. I agree. As Leif pointed out (at 8:46) the correlation falls apart before about 1990. Based on comments just below, I doubt Willis will waste his time on this. Thousands of papers have found such a link. Willis refuses to look at them. Scientific papers showing such correlation date back at least 200 years, to William Herschel, discoverer of planet Uranus and IR radiation, if not before. In the early 20th century, study after study found both correlation and causation between solar activity and monsoons, for example. We use 130 years data for studying correlative effects due to solar cycle and activity phenomena on the occurrence of the Indian Monsoon rainfall. We compute the correlation coefficients and significance of correlation coefficients for the seasonal and the annual data. We find that: (i) for the whole years 1871–2000, the spring and southwest monsoon rainfall variabilities have significant positive correlations with the sunspot activity during the corresponding period, (ii) the FFT and the wavelet analyses of the southwest monsoon rainfall variability show the periods 2.7, 16 and 22 year, respectively (similar to the periods found in sunspot occurrence data) and, (iii) there is a long-term trend indicating a gradual decrease of occurrence of rainfall variability by nearly 2.3 ± 1.3 mm/year and increase of sunspot activity by nearly 3.9 ± 1.5 sunspots/year compared to the activity of previous solar cycle. We speculate in this study a possible physical connection between the occurrence of the rainfall variability and the sunspot activity, and the flux of galactic cosmic rays. Owing to long-term positive and significant correlation of the spring and southwest monsoon rainfall variabilities with the sunspot activity, it is suggested that solar activity may be included as one of the crucial parameter in modeling and predicting the Indian monsoon rainfall. IIRC, which I might not, Willis did look at a study on Brazilian climate which, after first dismissing it, he checked on the validity of the climate records involved and admitted that the correlation was in fact genuine. Still a much better correlation than CO2 & temp. though. A C – Still a much better correlation than CO2 & temp. though. I agree an exact science it is not but nature doesn’t deal climate in straight lines, precise correlation and certainly not by consensuses. AC you get 10 out of 10 in my book! Dessler’s 2010 paper claiming observational positive cloud feedback had an r^2 of 0.02. McIntyre took it apart at the time. Despite that, it got lauded on the NASA climate website. Pure junk climate science. Dessler’s paper was basically a trend line on a scatterplot assuming zero lag. It was ridiculous. Choice of number of years lag. 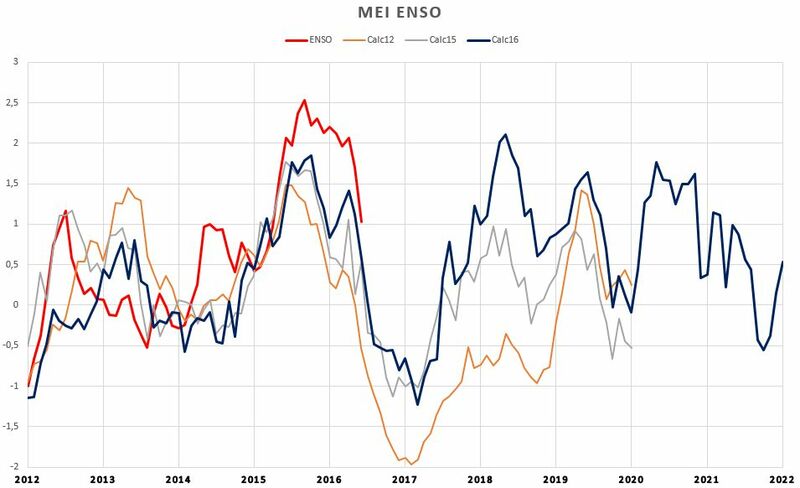 Choice of several different ENSO indices. A relationship with an R2 of 3.5% is the best they could find? leif svaalgard: only 3.5% of the variation can be ‘explained’ by the correlation. Solar variation could affect climate through numerous mechanisms, each of which has a small R^2, could it not? Except that the authors are claiming a specific effect and mechanism, not invoking many unknown mechanisms. ‘Could it not?’ is not a very convincing argument, is it? MM, while what you speculate is possible, the effects would not sum in some multivariate regression model of them to some bigger overall effect. An r^2 of zero means the two things have nothing to do with each other. On a scatter plot of the two variables, this can appear three ways: a ‘shotgun’ pattern, a horizontal line, or a vertical line. 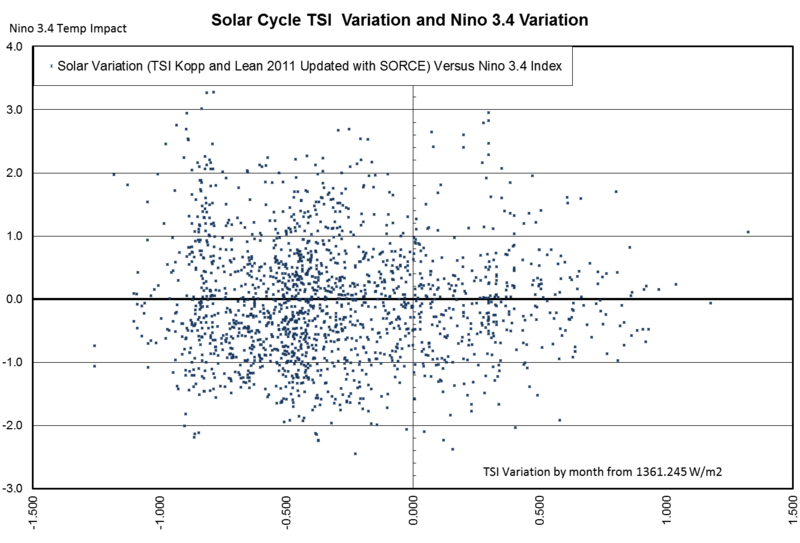 An r^2 of 1.0 means a perfect correlation, exact lockstep. With Appropriately scaled variables, this will appear as a 45%sloped line with no outliers, either up or down depending whether the correlation is positive (up) or negative (down). While it is true that correlation is not causation, it is also true that IF there is causation then there will ALWAYS be good correlation even if the cause of plotted A and B is some unplotted C. Essentially, what this paper’s statistics do is prove that the conclusion is wrong. Not just ‘Sum Ting Wong’. Completely wrong. Leif Svalgaard: not invoking many unknown mechanisms. No. I brought in the existence of other mechanisms. ‘Could it not?’ is not a very convincing argument, is it? I was not intending to persuade much of anything. Consider a medical intervention that had a “statistically significant” effect but accounted for “only” 3% of an important outcome like, say, life span, or adult body weight. Would you ignore it? Aspirin as prophylactic for heart attacks, say, or a partially effective malaria vaccine? Much of the trajectory of Earth temperatures is not well quantified, beyond the gross effects of sunlight like seasonal effects, latitudinal effects, and day/night effect. I expect most of the understanding of everything else will accrue a few percent at a time. Do folks see how the unicorn argument works now? “there could be… is always the signal to an appeal to ignorance” watch out for those words..
science rarely appeals to ignorance to explain things. When it does appeal to ignorance ( maybe there is a planet we havent seen) the proper way is to give instructions on what to look for..
over here for a planet to confirm our idea..
and ya, there is neptune. ristvan: while what you speculate is possible, the effects would not sum in some multivariate regression model of them to some bigger overall effect. a, yes it is possible and b, I didn’t say they would. R^2 = 0.035 is not equivalent to R^2=0. Steven Mosher: Do folks see how the unicorn argument works now? This “unicorn” has an R^2 of 0.035. Not impressive, but there it is. Maybe the result will be replicated and extended, maybe not. Faces with one tiny uncork you invoked the possible existence of a herd. Leif. Good point. But the paper Frankclimate linked to does show a strong decadal periodicity for Central Pacific El Niño (i.e. El Niños Modoki). Maybe there is a stronger correlation there. It looks like we have lots of data but we actually have 24 events (peaks of sunspot cycles) which we are trying to correlate with other events (the occurrence of an El Nino within two years). Viewed in that light, we have a small data set and a small correlation. I suspect that the paper demonstrates that there is no statistically significant correlation between the peaks of sunspot cycles and El Ninos within two years. So, your tame statistician phoned it in? Delightful tongue firmly in cheek quote. Nice catch. It is highly unlikely that such a low correlation would be significant using Student’s t on r*sqrt(n-2)/sqrt(1-r^2). I have given the paper a cursory reading, and I will return for a more thorough reading as soon as I can print it. I have to admit I don’t know much about ENSO other than its basic cycle. Though it has consequences for high latitudes, i had thought it resulted from feedback confined to the tropics. In fact the SOI almost suggests this because it is composed of statistics drawn from the equatorial pacific alone. This paper has a well written discussion of high latitude flow patterns that appear during and after the solar peak, and the consequences for surface temperature patterns in the central equatorial pacific. Speculative but interesting. What is interesting is this disclaimer at the bottom of the Abstract; perhaps it should’ve served as the intro. During my cursory reading, what strikes me is the frequent use of the words anomaly and anomalous. Apparently, the counterpoint of a high pressure is the anomalous anti-cyclonic low pressures… Or perhaps visa-versa. Let us remember that the EMI represents above average surface temps in the Central Pacific. The 1997/98 El Nino was an Eastern Pacific event and was barely a El Niño Modoki event. Seems odd to me that SSN effect temps in central Pacific but not the other “flavours” of enso as Bob Tisdale calls them. Temporal approach to the interaction may aeffect the word usage. Magical sunspots emitted from solar unicorns. As I have said the sun drives the climatic system of the earth therefore any changes in solar activity are going to translate to the climatic system. The problem is small changes in solar activity are going to be obscured because the climatic system has noise in it. So when one tries to show a solar climate connection when the sun is not in an extreme mode it gets very difficult and often times the noise in the climate system will actually overcome small solar changes and there impact upon the climate. Hence correlations are poor. However, if solar changes are large enough and long enough in duration then the solar/climate correlations become more apparent which has been demonstrated when one looks at the historical climatic record, which shows without exception every prolonged extreme minimum solar event has been associated with a drop in global temperatures. You forgot the kitchen sink and the fact that I will eventually cool the planet when my &%$*ing hot flashes go away, which of course is a lagged response caused by the modern solar maximum. Repeat after me, correlation is not causation. And when there is B-all correlation in the first place, I think this paper can safely be filed away in the circular filing cabinet. 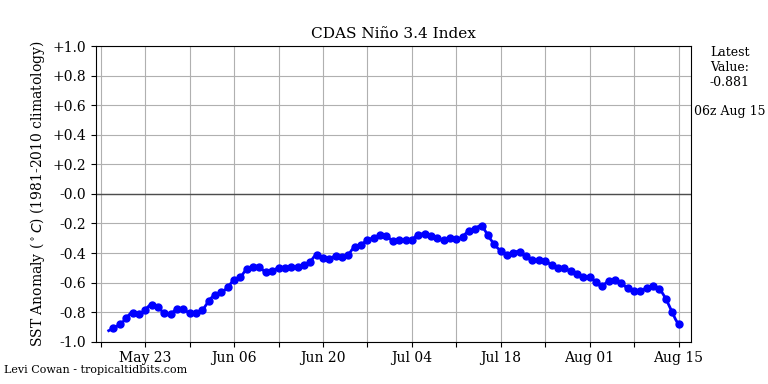 Help me here, is the Modoki index an index that follows El Nino, being a cooling of waters in the East Pacific and warming in the central Pacific (to be followed I suppose by a La Nina with warm West Pacific)? Is this just the Pacific Ocean sloshing about? RO, Tisdale teaches that Modokai ENSOs are simply those that do not reach all the way to the Americas. The ENSO gets stuck in the mid-Pacific, so to speak. Wow, a kindergartener could have phoned that one in. Good Job, China! Come on man. This is painful. The ‘analysis’, the discussion, goes in circles (never gets past name calling or the repeat of silly, pointless rhetoric) when there is zero understanding/discussion of the hypothesized MECHANISMS, when there is zero structure to solving the problem, when those involved cannot imagine the possibility that the sun is different than the standard model and hence can never construct an alternative hypothesis, and so on. Where are the dang review articles of the mechanisms? Where are the review articles concerning how planetary temperature has changed in the past? It has been known for more than 20 years that there are cycles of warming and cooling (sometimes abrupt cooling) in the paleo record which correlate with solar cycle changes. The question is not if the sun causes cyclic warming and cooling (some times very, very, large changes in planetary temperature -see burn marks on surface of earth- which is one of the observations that supports the assertion that the solar cycle can be interrupted and that the sun is significantly different than the standard model) of the planet, but rather how. Many paleoclimatic data reveal a approx. 1,500 year cyclicity of unknown origin. A crucial question is how stable and regular this cycle is. An analysis of the GISP2 ice core record from Greenland reveals that abrupt climate events appear to be paced by a 1,470-year cycle with a period that is probably stable to within a few percent; with 95% confidence the period is maintained to better than 12% over at least 23 cycles. (William: Come on man. 23 cycles. 23 cycles) This highly precise clock points to an origin outside the Earth system (William: Solar magnetic cycle changes cause warming and cooling); oscillatory modes within the Earth system can be expected to be far more irregular in period. 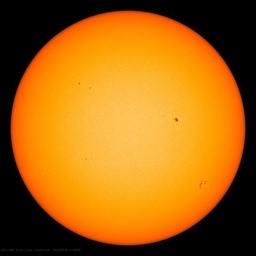 We are about to experience in real time, how an interruption to the solar cycle causes a Heinrich event and people are still plotting sunspots vs whatever and talking endless about atmospheric CO2 levels. P.S. The sun is significantly different than the standard model. That explains why an interruption to the solar cycle can and does occur. There are hundreds paradoxes and anomalies in peer reviewed astronomical papers (none of the paradoxes make it into the text books) that support the assertion that the sun and stars are significantly different than the standard model. Sun spot count (closed magnetic flux on the surface of the sun) is a rough measure of one of two solar phenomena that create solar wind bursts. The solar wind bursts remove cloud forming ions from the high latitude regions and the tropics changing the amount of cloud cover and the properties of the clouds, by creating a space charge differential in the ionosphere. The process where solar wind bursts remove and add ions to the clouds is called electroscavenging. Electroscavenging is what amplifies or inhibits El Niño events. Coronal holes, open magnetic flux regions on the sun, also cause solar wind bursts. What causes coronal holes to form is not known. P.S. For some unexplained reason the sun is now covered with coronal holes. The coronal holes of course cause solar wind bursts which explains why the planet has not cooled due to the increase in GCR which. Coronal holes can persist for months and have for some unknown reason occurred late in the solar cycle in low latitude regions thereby causing solar wind bursts to occur when there are few sun spots on the surface of the sun or no sunspots. Coronal holes make it appear that the solar magnetic cycle is not the primary modulator of the earth’s. The solar magnetic cycle also modulates the amount of high speed particles (called cosmic ray flux (CRF) or galactic cosmic rays (GCR) for historical reasons, the discoverers thought the phenomena was caused by a ray rather than a particle and the misleading name stuck) that strike the earth’s atmosphere creating cloud forming ions. Solar wind bursts remove and change the ions in the atmosphere, so solar wind bursts change make it appear that an increase in CRF/GRF does not cause there to be an increase in cloud cover in high latitude regions. …which reflects all solar activity, and it is highly correlated to global temperature variations in the whole period for which we have data. …. The following is a review paper that discusses some of the mechanisms by which solar changes modulate planetary climate. no, the standard solar ‘model’ is a very good description of the real sun. That is why it is called the ‘standard model’. WA’s comment has neither a good beginning nor a good ending (see comment below). The middle can therefore be reasonably ignored. The Standard Solar ‘model’ may or may not be a very good description of the real sun! It is more likely called the standard solar ‘model’ because that is the model solar “consensus scientists” accept to be the best at this time. We have observations, ideas and theories. Some one does some research and comes up with a paper explaining how something works which is the best at the time. This becomes “fact” and is taught at schools and universities. These “facts” are often then defended to the hilt and are very difficult to change, generally due to vested interests and egos, or they may even be true. Does an atom consist of a nucleus with protons and neutrons with electrons orbiting it or are electrons negatively charged magnetic atoms, protons positively charged magnetic atoms and neutrons neutral magnetic atoms? What is the centre of the earth made of? Is this a good description of the real earth or not? How does this interact with the Sun and affect our climate? Everything that exists in this dimension is made up of vibrating atoms. Both the real sun and the real Lief are just vibrating atoms. Lief you are doing good work. I am just suggesting that some of the things we accept as “fact” may not be as they seem. They may just be the best idea we have at this time. “There are more things in heaven and earth Horatio, than are dreamt of in your philosophy.” – Shakespeare. It is model that best fits the observations. WA, color me very unimpressed. I was curious, as the ‘sun done it’ perspective seems to be generating a lot of heat without a lot of light. So I read your suggested review (last comment reference, Albany EDU. Abstract and first section claim strong GCR/cloud correlation, particularly in Southern Ocean around Antarctic. Claimed support was fig. 2.1. Well, that shows a few (dark) statistically significant areas, maybe 20% of the total area, but mostly NOTHING. Hardly the asserted strong general correlation. The review assertion is not supported by the review evidence, right off the bat. Stopped reading the review; if it starts out that bad, it isn’t going to get better. Since Southern ocean is least well observed of all, I was curious how f2.1 was derived in the original 2001 GRL paper by Kniveton and Todd. So checked it out, and also a 2004 update not behind paywall by the same authors. Nothing to do with the solar cycle as your comment implies, the review indisputably claims. Was a comparison of Forbush Decrease (FD) events to ISCCP cloud data. FDs are very short term. We dissected another very shakey paper on FDs here recently (Svensmark’s newest), where a short term effect was supposedly teased out by inventing an FD ‘strength’ index to compare to TOA measured albedo reflection as a proxy for clouds. FD events last 1-2 days, and any supposed effect less than a week according to that paper. And, the 2004 K-T update expressly cautioned that the ISCCP cloud data were not reliable in these lattitudes, especially on those time frames. So GIGO statistical mush on FDs and ISCCP clouds. Not strong general correlations, suspect weak regional correlations on a few FD snapshots of a few days. So my one hour spot check crumbled the whole mess rather completely. Commenting that it is so does not make it so. The case here. Where the solar cycle GCR hypothesis fails IMO is in its starting null that GCRs are essential cloud nucleators that can vary clouds, albedo, and climate. They aren’t. There are enormous biological sources of cloud nucleating aerosols and have been for several hundred million years. Specifically terpenes from coniferous forests, isoprenes from deciduous and tropical forests ( isoprenes make the Great Smokey mountains ‘smokey’ with lightly condensed ‘fog’), and dimethylsulfides from marine phytoplanckton. Whatever solar variation does to GCRs impact on clouds is a pimple on an elephant. It seems to me you are drawing your conclusions when solar activity is more or less normal and not in an extreme condition. Also it looks like you have not looked at the historical climatic record which clearly shows solar extremes do influence the climate. At the .agu link you give there is a report available from the NAS. The report is on Atmospheric chemistry…. Free to download pdf, 207 pages. Webinar on it on September 20. Just had time to look through briefly. Interesting graphs etc. Nothing good about CO2, at least not obvious so far in my reading. @William Astley: I was intrigued by your reference to “Once again about global warming and solar activity”, especially figure 6, which demonstrates a very high correlation (85% with p < 0.01) between the "AK-index" and global temperature anomalies. The paper refers to Nevanlinna and Kataja 2003, but only cites Nevanlinna, H., & Kataja, E. 1993. I'd very much like to understand the "AK-index" better and would appreciate help clarifying the citation if you can offer it. Nonsense, this El Nino was not an El Nino Modoki. An El Nino Modoki takes place in the Central Pacific when the path of an El Nino wave traveling eastward along the equatorial counter-current is blocked. 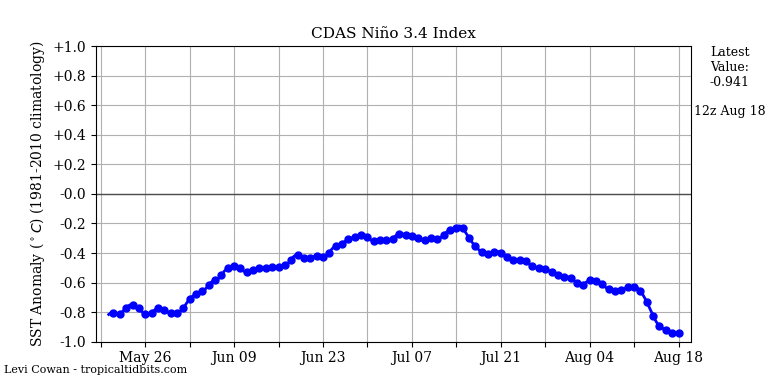 The La Nina that follows it may also be abnormal or missing. As to the long term correlation of El Ninos and sun spots it is quite unlikely. The sunspot cycle is eleven years and the length of an El Nino/La Nina cycle is approximately five. It is possible for the two cycles to bring some El Nino peaks into the vicinity of a few sun spot maxima until the cycles drift apart again. . Additionally, the absence of any physical connection between El Nino and sunspots makes this correlation very unlikely. William we are on the same page. Slow solar wind periods with a much smaller lag is a far better candidate for El Nino episodes. Faster solar wind periods are well apparent through the La Nina episodes. September 10, 2016 at 1:04 pm: I was wondering, Lief, about this El Nino being so big. I had the impression it was only modest, but the Blob magnified the effects. The Blob’s provenance, and the central placement of the El Nino, seem to pose worthwhile research problems. But I won’t be surprised if we are surprised!. Not everything is connected even if adjacent. It looks good in the 2014-15 season but yes the relationship does fall apart in the 2015-2016 season. Just an observation from someone living in Southern California – what El Nino? You don’t need much of an incremental burst of heat to boil a pot of water when its already pretty hot. I quite like the variability in solar wind and thermal lag theory that goes back to Landscheidt. If the average solar wind during an active solar cycle is already high and you get a burst at the solar peak that could lead to a big El Nino event. Are weasel words. Show that it actually does. Perhaps the authors would care to comment? Anthony was a bit too fast in presenting us that info. To what Bob Tisdale, Frank, Leif Svalgaard, ristvan and Arno Arrak wrote, there is nothing to add. Strange stuff, full of contradictions. B, A different perspective. This paper is out there and now it has been shredded by a few trenchant obsevations in the modern equivalent of ‘true’ peer review in this post. We can move on without foolishly claiming it helps disprove the AGW hypothesis when it doesn’t. Just like Svensmark’s recent paper was touted in the blogosphere as doing so (e.g. at GWPF) when it doesn’t and the weaknesses were pointed out here. And we can always come back to refresh the shredding if needed for future reference. Putting this stuff up for review here is IMO good. Skeptics need to sort climate science wheat from chaff when it comes to their anti-warmunist arguments. Why paint easy targets on yourself allowing warmunists to shoot you down as an unscientific, unknowledable, or worse a stupid ‘den**r’? The Diciccio ethanol paper is another easy target that should not be cited because it is way wrong despite fitting a lot of skeptical confirmation bias. As wrong as any version of CO2 cannot warm because…(trace gas, cannot heat, saturated)…and I see those false arguments made here unfortunately too often despite being diligent in explaining why wrong. This site, CE, CA, and a few others need to coalesce around proven ‘true’ skeptical arguments until all skeptics start to speak with more of a single voice, and not chase all the really sketchy counter AGW fluff. And we need to review very critically all the warmunist stuff that is continually produced, like McIntyre recently did to Gergis 2016 at CA ,or I did to the 2016 Totten Glacier paper and its MSM reporting at CE, or like Nic Lewis did to the absurd new ‘AGW started in 1830’ paper at both CA and CE, or like Jim Steele did here concerning the most recent GBR false alarms. That way skeptics have a one or two soundbite put down if warmunists or the general public raise those junk papers (or junk reports on what might otherwise be a good paper, e.g. Totten) in some dialog. Perhaps I will expand this thought into a possible guest post with many specifics as a ‘talking points’ paper. ristvan, I’m neither warmist nor coolist. Would you please point to a paper that shows experimental results of the warming caused by the 3 or 4 CO2 man contributed molecules out of the 30 out of 100000 air molecules. I cant find any, but you seem to know well the climate paper world so please give me the link. In addition as a simple minded sceptic third class I would like from you a few like 3 or 4 pungent points about AGW. Since the world is decarbonating itself it looks like that sceptics don’t have much of a leg to stand on. ristvan: B, A different perspective. This paper is out there and now it has been shredded by a few trenchant obsevations in the modern equivalent of ‘true’ peer review in this post. We can move on without foolishly claiming it helps disprove the AGW hypothesis when it doesn’t. The paper was not “shredded”, and no one (unless I missed it) claimed that it helps to disprove the AGW hypothesis. It’s tiny effect generating some overreaction. This site, CE, CA, and a few others need to coalesce around proven ‘true’ skeptical arguments until all skeptics start to speak with more of a single voice, and not chase all the really sketchy counter AGW fluff. I think that is absurd, but for the sake of discussion, what do you think are the “proven true” skeptical arguments? B, neither am I. Just a ‘trueist’ which in this context means a weak lukewarmer (in the climate war vernacular). My main interest is seeing how this massive science/public policy debate plays out in the internet era. Because it will change the dynamic on a lot of other public policy things where there is belief induced policy gridlock. If I wanted to cash in big time on my energy storage patents, I would be a loud warmunist shill. Nope. Those fundamental patents can and will make a modest contribution to statcomm reactive grid power regulation, and to hybrid vehicle cost and performance. My pride in them was provably correcting a basic convonventional but very flawed scientific ‘insight’. Textbooks and university syllibi on the Helmholtz double layer capacitance charge storage mechanism have to be rewritten. That is reward enough, although the money ain’t bad. ristvan: Just a ‘trueist’ which in this context means a weak lukewarmer (in the climate war vernacular). I think that is true of me as well. I think that the diverse “solar hypotheses” are more-or-less on “life support”, with gangs of supporters looking for signs of life in studies like this one. On the other hand, neither do I believe that R^2=0.035 is equivalent to R^2 = 0.0, because of the large set of effects, like those in health and product quality control, where small effects maintained on a large scale are important. Everyone claims to believe in “truth”; self-identifying as a “trueist” isn’t worth much for either of us, or anyone else. A. 1. All of the effects of solar variations on climate are known. 2 There are some effects of solar variation on climate that are yet to be discovered and characterized. There is insufficient evidence to support either one of those strongly, so believing that one or the other is necessarily true is foolish. Right now, it seems to me and to a whole lot of researchers that 2 is the better bet. B. 1. Any newly discovered mechanisms will have large R^2. 2. Newly discovered mechanisms by which solar variations affect climate will have small R^2 values. Is there evidence to support the first of these propositions over the second? Given the large effects already known (day/night, latitudinal, seasonal), my bets would be on 2. If 2 is true, it will be established by dozens, maybe hundreds, of papers like the one that is the focus of this thread; not by any single greatly convincing paper. And consider some questions: If the effects of CO2 increase on climate warming have been exaggerated (leaving aside the question of whether any effects to date are good or bad for biota), what’s responsible for the increase in global mean temp since 1880? Since the end of WWII? When examined over the length of the historical record, will the relationship have a large R^2? This paper is in a sort of epistemological Limbo, but a Limbo that hopefully will not be permanent. Some not so enquiring minds here. You don’t throw away the hypothesis just because you see outliers. Particularly when there are multiple forces at play. Take 1982/83 on the chart. Seems to be an outlier but a lot of the metrics suggest we were headed to an El Nino event until El Chichon. 82/83 would likely have been a fit otherwise. Still the period that stands out as being out of step is from 1940-1970. I’m not saying I support the hypothesis. Simply look a little closer at the parts that don’t fit before throwing it out. that 1982/83 was as strong as 1997/98. since tropical SST is one of the components co MIE, the correlation to UAH tropical air temps is not too surprising. However, I like the volcanic angle. Plotting the difference would be interesting, perhaps compared to tropical AOD. Greg: I lack time to do. There you see an analysis of relations between TLT temp, SAOD and SW reflection to outer space at TOA. The problem with this is, it’s more to do with ‘Seance’ than science. (A good source of income throughout the ages). They tend to ‘Believe’ in their interpretation of Science. This article is bad science from unknown scientists published in an obscure Chinese journal. Why are we wasting our time with it? If the GWPF want to destroy their credibility by unearthing rubbish let them do it, but WUWT should have some type of filter to prevent awful posts like this one. I am not critical of the paper because it is published in a obscure Chinese journal. Nor do I feel it should have been ignored. I feel the authors did not make their case and did not put their best foot forward. I tend to agree with ” ristvan September 10, 2016 at 3:12 pm” We need to police ourselves so that the general public can have some faith in what we present. Many people do not have the time or skill to go through and verify the accuracy and truthfulness of a scientific article submitted as news. The GWPF brought this paper to the public’s attention. If someone from that organization examines the comments and observations made here they may adjust their views on this paper or any endorsements. Self honesty creates trust and credibility in others; and makes them more willing to hear you out. Javier, as said to B above, I disagree. The review here ripped this nonsense to shreds in just a few hours. Bring it all on. 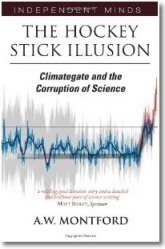 It strengthens to core skeptical credibility to shred nonsense on both sides of the likely ‘true’ climate science. Both sides. Well, there are literally tens of thousands of papers published every month. The great majority are not worth the time to read them. Most of them will get less than 10 scientific citations as they only interest to people working on the exact same issues, and some not even. There can be wonderful articles in obscure journals, but as all authors try to publish the best they can, a reputable journal already indicates some selection. I can only read a handful of papers per week, so I rather get interesting papers and skip the rest. If WUWT is going to discuss irrelevant papers then it will be not worth my time either. ristvan: The review here ripped this nonsense to shreds in just a few hours. Where? 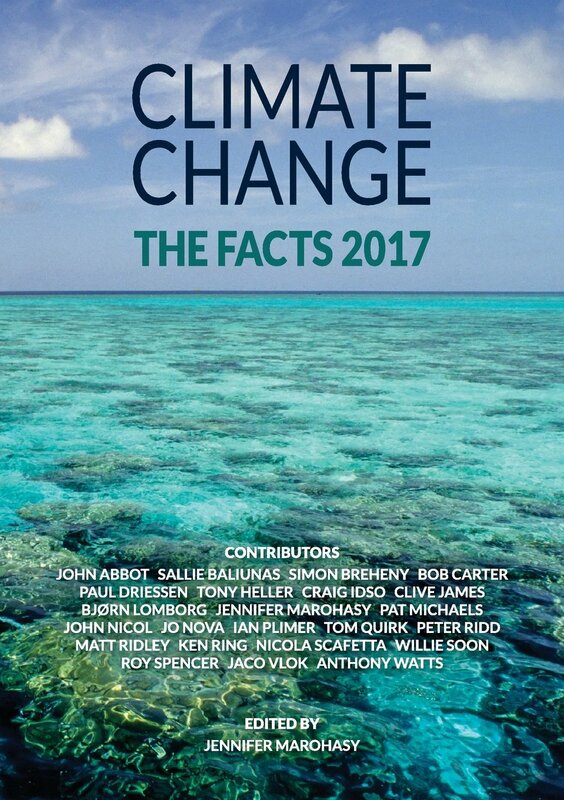 frankclimate misread two of the references; Bob Tisdale and Leif Svalgaard agree with the authors that the R^2 is small. The one serious possibility (this may have been mentioned, but if so I missed it) is that they authors may have done much more statistical analysis than reported, and then reported only the “significant” effect that they liked — that is an extremely common error not recognized as an error by enough researchers. Was waiting for that, Matt. Javier, it is quite an interesting subject, but as you say, it lacks credibility, not because it was by unknown scientists or because where it was published, but because the correlation is very weak in their own figures. Kind of the situation if you put two data sets against each other, stipulate a time period, you are likely to see some correlation by coincidence. In their particular case, they didn’t even stick to the 1-3 years they stipulated in the text. It was an interesting read, thought, and hopefully it can inspire some further research by someone else. Javier that has been my point with other articles so many of which are wasting are time. The articles that come over on this site however should be able to come because we need to see all of the various thinking. So what I do is look at everything and start to read and determine within 5 min. if it is a waste of time or not. Even if I determine it to be a waste of time at least I am aware of it and one never knows if some articles we think today are a waste of time turn out not to be. I doubt it but never say never especially when it comes to climate. I may be 95 % sure on some things I feel strongly about but never 100% on anything. Hmmm…that reminds me of something. What even in a chaotic system? Per Strandberg reckons lunar tidal force is the main ENSO driver and who am I to disagree. Driver, I’m not so sure but trigger yes. This is something I have been saying for several years. The temp anomalies seen in the vertical equatorial section of the Pacific can disperse without the ‘anomaly’ ever reaching the surface. This means that they reflect equatorwards and equator-fugal, north-south movements of water mass. Glad to see this is getting some thought. More specifically, it is a combination of the combined tidal gravitational force of the Moon and the Sun during Lunar Perigee which is the main force or trigger for changes of ENSO. Because both the strength and latitudinal angle vary greatly and seemingly chaotic, this pressure fluctuation which vary on a near global scale is the main driver of ENSO and most likely also the main driver of both QBO and JMO. Electromagnetic variations of the Sun also affect ENSO, but to a lesser degree. The blue line is the average of recent forecast based on the average of 9 ensembles on my ANN with real solar values up to the end of 2015. The other forecast was based on earlier forecast with real solar values up to the end of 2012 and 2014. As can be seen, currently the ENSO is currently in a hiatus of a weak La Niña, but my indication is that this La Niña is going to strengthen in the coming months in contrast to what other forecasts indicate. Time will tell! SOI shows that El Niño could develop in 2014. It does? How’s that work? Good one!! The sun’s polarities have already struck the earths oceans as they rotate and reverse, are you saying that the sun did not cause the recorded increase energy escaping from our planet? because it is actually observed. Can I simply say, Duh! Any discussion of phenomena related to ocean temperatures and convection-driven currents is pure BS unless stochastic heat inputs from ocean floor vulcanism and tectonic spreading centers is considered in detail. Applying such large amounts of heat at the bottom of a body of water must inevitably lead to local convection currents that WILL affect surface stream flows. This solar interaction with the Earth is very important. the climate diabolical is not, there are so-called professionals paid and bought for, just for their position. The timing of the suns polarities as they rotate and reverse are the cause of Earth’s weather and over time, its weather patterns. I want to discuss a specific “natural” process that occurs and will occur on the sun. every statement is unadulterated nonsense. Feel free to elaborate Lief? give some insight for a change. Obviously by “unadulterated” you meant ‘complete and absolute’ but then you added “nonsense” on the end of your sentence. Coronal Holes I know are more common after the maximum of a sunspot cycle as the sun heads toward minimum conditions. Why? How prevalent are coronal holes during prolonged solar minimums such as the Maunder or Dalton? There will be a ‘sweet’ spot [oval] somewhere during the declining phase. Geomagnetic activity will maximize during that sweet spot. 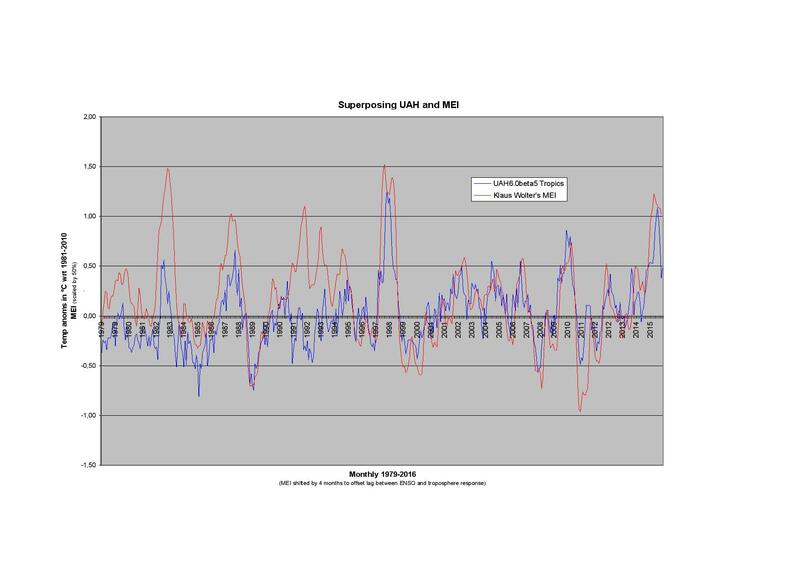 For the Maunder Minimum, the situation is interesting. Some people claim that the sun was one big coronal hole and other people claim that there were no coronal holes. We know from cosmic ray proxies that the modulation of the GCRs was strong and healthy during the MM. Also that comet tails [produced by the solar wind coming from coronal holes] were clearly present, so perhaps coronal holes were common. If so, geomagnetic activity should have been significant. Is it possible that there is a series of interconnected variables that create the warming earth conditions that we can’t study due to either lack of knowledge or weak computer processing ability? As a total lay person with a science background I yearn for honest and open discussion around what we know and don’t know. That seems like a trick question to some however in my head I think of ways to disproved a theory…in the absense of that debate one can think the only truth is in the media. I was contemplating…why does the Earth have El Niños? When I remember the saying…the simplest answer is likely the right answer my first thought is as a way for the Earth to cool and release heat to the atmosphere and out into space. In that case…what has been changing or not changing for the past 13,000 years to have warmed us up to the point glaciers shrunk hundreds of miles? Solar winds? Sun phases? It seems what system would be designed in nature to have all the carbon lost to sinks never to be used again? All the media reports fail to say what has been causing warming for the past 13,000 years. To say that we are warming faster now than ever fails to address how we know that given we can’t narrow down any 30 year period 12,000 years ago. We keep using computer models that frustrates me as a scientist because how do you disprove a model? Time tells all I suppose but in the meanwhile people make up their minds on a computer guess. We keep hearing how data is getting normalized, cleaned, corrected, refined, limited, extrapolated…but I want to know what that all means. Why have many measurement sites been removed? Who decides what data is changed and how much? When we talk about such small incremental changes in temperatures we can easily have issues with data integrity. I would love a site that has all the pros and cons theories. A site that allows for debate. Open minded scientists that participate. Maybe even some financial reward for the collaboration of good “science” and not just science that captures funding and pays the bills. Actually, it has been cooling the past 13,000 years [with minor fluctuations up and down on the way]. Good to have a comment like that as it poses questions and questions lead to more questions and we see that all is not as black and white and some hope. 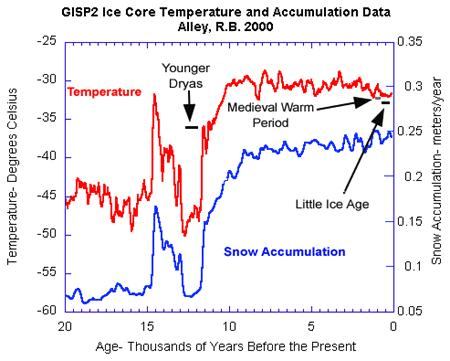 Common perception is that since the last ice age we have been warming. I would not even bother to calculate a correlation coefficient for this supposed relationship. In my view, a far more likely candidate for the most recent El Nino was the eruption of the Icelandic volcano Bardarbunga between August, 2014 and February, 2015. This was the largest basaltic eruption since that of Laki in 1783. Being non-explosive, it did not inject material into the stratosphere to reflect sunlight, and hence had no significant cooling effect. What it did produce was a large quantity of chlorine and bromine in the form of HCl and HBr, which would not have been rained out, as typically happens with explosive, cloud-producing volcanoes, but would have mixed into the atmosphere to become dissociated in polar stratospheric clouds, releasing chlorine and bromine to deplete ozone catalytically. This would have admitted increased irradiation by solar ultraviolet-B, which would produce global warming. This would have been an effect similar to the release of anthropogenic CFCs from the ’70s until CFCs were banned by the Montreal Protocol in the ’90s. This time interval saw an upswing of global temperature similar to but more extensive than that of 2015. CFCs were banned because of concern over sunburn and genetic damage, and apparently no one thought of the warming effect they would cause, but in fact UV-B is 48 times as intense as Earth’s IR that is absorbed by CO2. The warming effect of ozone depletion by chlorine and bromine, whether released from CFCs or non-explosive volcanism, has unfortunately not been considered in the theoretical press of concern over the possible effect of CO2 on global warming.